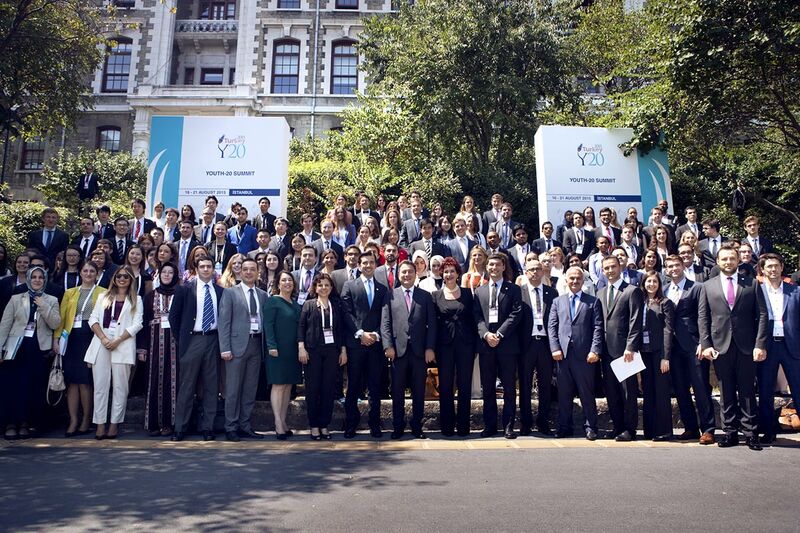 Boğaziçi University hosted the 10th Summit Meeting of Youth-20 (Y20), the official Outreach Program of G20, on August 16-21, 2015. The Summit was organized by the Youth Commission for Diplomacy and Collaboration (YCDC), with the support of the term presidency of G20, which is currently held by Turkey. The Summit started on August 17. The Summit was attended by delegations from G20 countries including Argentina, Brazil, Canada, China, European Union countries, Indonesia, Turkey, the United States and the United Kingdom. Y20 delegates discussed topics of global importance such as youth unemployment, the education of youth in the 21st Century, and youth’s contribution to peace. Mr. Ali Babacan, former Minister of State and Deputy Prime Minister, was also among the participants. The Y20 Summit opened on August 17 with the opening speech of President Gülay Barbarosoğlu, who expressed her pleasure at the opportunity to host the Summit at Boğaziçi University and briefed the guests on the University’s history. As an institution that integrates liberal values and the culture of democracy, Boğaziçi University upholds academic independence, independent thought and scientific research. The University’s primary aim is to invest in today’s youth, who will be the leaders of the future. In her speech, Barbarosoğlu expressed that the Y20 Summit formed an important platform with regard to this investment. She talked about the major national and global changes that have taken place in political and economic systems in the past 10 years, and said that the world was now at a historical crossroads in the age of knowledge revolution. Barbarosoğlu maintained that social development encompasses the concepts of peace, environment, social justice, political participation, and freedom, and referred to the significant role of education in this regard. In his speech, former Minister of State and Deputy Prime Minister Ali Babacan stressed that youth meant the future and that a better future would be built by youth. Pointing to the need for a synergy among universities, civil society and governments, Babacan also commented on the current situation of the global economy. According to Babacan, many developed countries are still in dire straits due to recent economic crises, youth unemployment being one of the most significant challenges facing them. The most important investment any country can make is “investing in people,” Babacan said, and added that a strong education and skills training strategy was on the agenda of G20 as a means of investing in youth. Babacan also referred to the importance of Lifelong Learning in this regard. Following the welcoming speech of Y20 Turkey Chair Dr. Emre Cenker, G20 Sherpa Ambassador and Deputy Undersecretary for Economic Affairs at the Turkish Ministry of Foreign Affairs Ayşe Sinirlioğlu offered her thanks to President Gülay Barbarosoğlu for her contributions to the Y20 Summit. Drawing attention to the increasing rate of youth unemployment and socio-economic inequality around the world, Sinirlioğlu stated that over 100 million young people around the world, including many from G20 countries, were employed in the shadow economy. She explained that G20 was aware of the pressing need to create opportunities for young people and to integrate them into the economy, and that youth employment was a matter of priority. Sinirlioğlu referred to the “Skills Strategies” that the G20 had been developing with the objective of creating employment and integrating unemployed youth into the economy. She stressed that the Y20 Summit would contribute to the G20 Summit to be held in Antalya in November. Y20 (Youth-20) is an international platform for youth and the official outreach program of the G20 (Group 20) Summit. The objective of the Y20 Summit is to provide a platform for young people from G20 countries to come together to discuss global issues, to develop an understanding of different cultures, and to create a global network for young people. The Y20 Summit provides an opportunity for youth to communicate to decision makers their concerns about issues that are important for young people and their proposals for innovative solutions. The official negotiation processes of the G20 Summit meetings serve as a model for the Y20 Summits held annually. The objective of this yearlong process is to enable young people across G20 countries to understand and contribute to the issues on the agenda of the G20. Countries participating in the Summit are represented by delegations of five members. At the end of the Summit, the delegates release a report referred to as the “Final Communiqué”. The Final Communiqué is conveyed to G20 leaders immediately after the Summit so as to inspire them on solutions to global challenges. The Y20 is organized by the Youth Commission for Diplomacy and Collaboration (YCDC) and is supported by the Office of the President of the Republic of Turkey. The Y20 Turkey 2015 Summit is acknowledged as an important platform where new generations can have their voices heard, shape their future, and propose solutions to G20 leaders.